SPACE-13-TEC-2019 Electric Propulsion Disruptive Call (2019) is open! You can download the updated (July 2018) Horizon 2020 Space Work Programme 2018-2020 or go to this link in the EC H2020 participant portal. The Horizon 2020 Space Work Programme 2018-2020 will be updated by mid-2019 for the 2020 Calls. 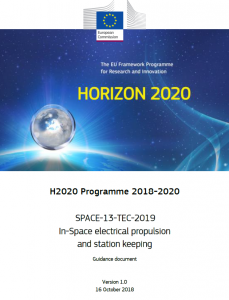 The associated Guidance document applicable for the SPACE-13-TEC-2019 SRC Electric Propulsion topic has been already published by the EC in this link: (http://ec.europa.eu/growth/sectors/space/research/horizon-2020/). These guidance and requirements should be followed by applicants in their proposals. Type of Action: Research and Innovation action (RIA).